Who is the Best Female Poker Player? The Best Female Poker Player Is..
Q: Who is the Best Female Poker Player? A: Who is the best female poker player? This is one of those questions to which there are multiple "right" answers. In terms of cash games, many pros will tell you that Jennifer Harman is the top female player in the world. After all, Harman is the only female who is a regular player in the "Big Game" in Las Vegas. We'll never know exactly how much money Harman has won or lost playing in big "live" cash games, but her fellow players speak very highly of her game, so I would assume that she has done fairly well for herself. In terms of tournaments, it's pretty hard to argue that Kathy Liebert isn't the top female player in the world. Liebert has nearly $6 million in total lifetime tournament cashes, which puts her at #1 on the women's all-time money list. Annie Duke ($4,270,549) and Annette Obrestad ($3,703,471) are a fair distance behind. Liebert has been incredibly consistent over the course of her career - from 1994 to 2010, Liebert has had 11 years in which she has earned at least $100,000 in "live" poker tournament cashes. 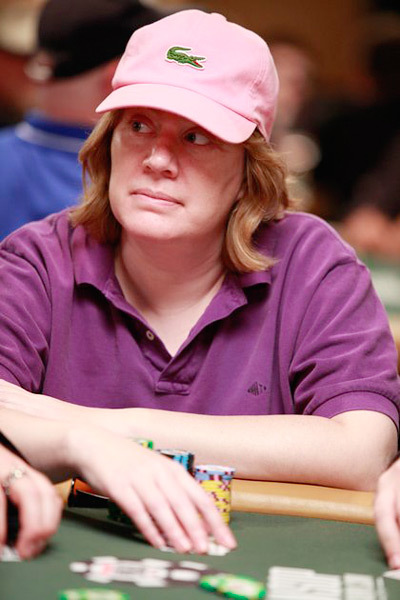 Kathy Liebert has one World Series of Poker bracelet (2004 $1,500 Limit Hold'em Shootout) and 30 cashes in WSOP events. Liebert has also made a couple of deep runs in the World Series of Poker main event, including a 17th place finish in both 1998 and 2000. Liebert has made six World Poker Tour final tables over the course of her career, including a second place finish in the 2009 Bay 101 Shooting Stars ($550,000) and a third place finish in the 2005 Borgata Poker Open ($427,115). Liebert has continued to put up consistent results, even in the age of the "Internet player". Players such as Vanessa Selbst and Annette Obrestad will likely challenge for the title of "best female player" in the future, but Liebert's consistent results and almost $6 million in lifetime tournament cashes gives her the nod for now.